This weekend we begin the most sacred week of the year for Christians. We recall Christ’s passion, death and resurrection. We are reminded of all that God has done for us in sending us His Only Begotten Son. Palm Sunday recalls Jesus’ triumphant entry into the city of Jerusalem. His royal reception sees Him being lauded by the crowd: Hosanna to the Son of David; blessed is he who comes in the name of the Lord; hosanna in the highest. (Mt. 21:9) However, entering Jerusalem meant that Jesus was now ready to begin His bitter passion and to face death on a cross. The crowd quickly turned on Him as they chanted: Let him be crucified! . . . Let him be crucified! (Mt. 27: 22-23) We can see how quickly any glory and honor that the world may have for any of us can change to ridicule, scorn and even hatred. 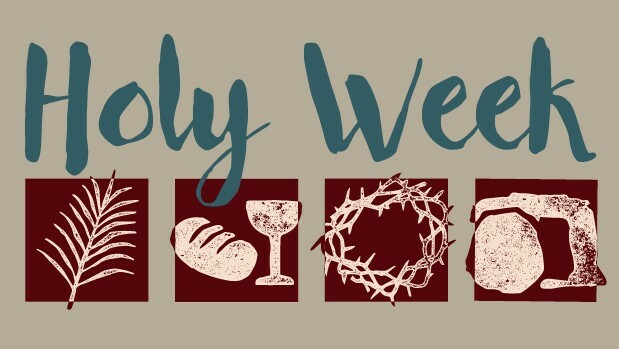 The liturgy of the Passion of the Lord on Good Friday (3 PM, St. Patrick Church) has 3 main components: a reading of the passion account from St. John’s gospel followed by various intercessions, veneration of the cross and Holy Communion. Masses are not offered on Good Friday. The Easter Vigil (8 PM, Worship Center) is not intended as a Mass to be rushed through quickly. (Please note: Mass usually lasts minimally about 2 hours.) There are so many beautiful parts that, if done reverently and properly, should not be hurried or omitted. We begin with a lighting of the Easter fire and a candlelight ceremony. Then follows the singing of the Exultet or Easter Proclamation. Salvation history is traced through a series of readings as the congregation is reminded of how God has continued to work in and through every age. After the readings comes the time to bring new members into the Catholic Church through Baptism and the reception of other Sacraments of Initiation (Confirmation & Holy Communion). The Easter water is blessed at this time and sprinkled on the congregation as we renew our baptismal promises. Finally, Mass continues in normal fashion with the Liturgy of the Eucharist. Please consider participation in these liturgies of the Easter Triduum. We all need to be reminded of what Christ has done for us. The little time that we might spend in Church pales in comparison to the hours that he suffered for us on the cross. Also, the last scheduled time for Confession (the Sacrament of Penance and Reconciliation) before Easter is Wednesday, April 17 at 7 PM in St. Patrick Church. For all of you procrastinators, please take note of this important opportunity.